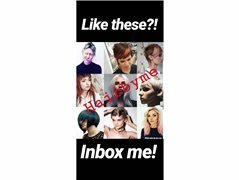 I am an experienced hair colourist and can often be found teaching or presenting what I do on hair stages - Super passionate! And I need lots of models for lots of hair colour techniques! Whether it's highlights, a rich tint, or something creative and colourful - Please get in touch!